MEGA – SUPER – HIGH – SHINE! 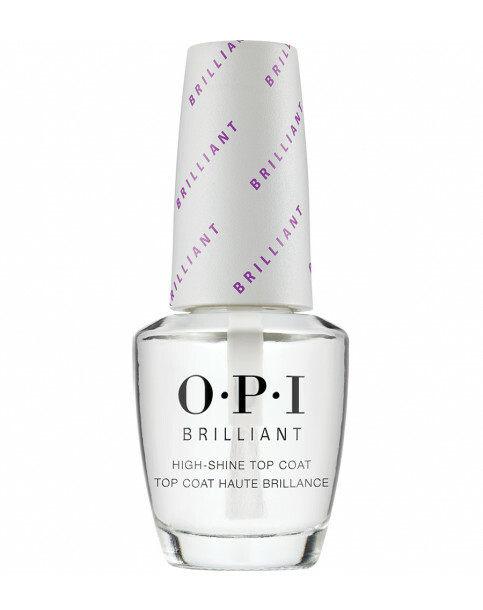 New Brilliant Top Coat that provides manicures and pedicures with an unparalleled level of shine. Brilliant Top Coat is rated 2.2 out of 5 by 5. Rated 1 out of 5 by NailsByLottie from Not what I was expecting This top coat was bought in addition with another OPI nail colour. I applied the nail colour and let it dry overnight. The next day I applied the top coat with the hopes it would allow me to last the day without any chips in my polish. After applying the top coat to my nail I noticed the colour from my nail varnish had come off and had stained onto the brush meaning everytime I use it, i have to wipe the brush off to avoid colour contamination and risk of tinting the entire bottle of top coat whatever colour I may have recently used. Rated 2 out of 5 by trulyscrumptious from Not as shiny as I hoped I was disappointed that this product doesn't give as high shine as other top coats I have used. Rated 1 out of 5 by Sar27 from Awful Not great. Overpriced for result you get. Brought as a gift. Not impressed.